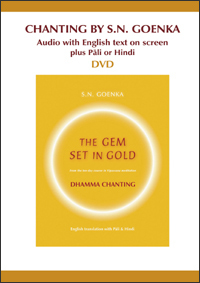 This DVD has the audio recording and the text of the both the English translations and the Pali and Hindi chanting by S.N. Goenka from a ten-day Vipassana meditation course, which play simultaneously on the screen. The DVD contains a menu to easily find specific chantings, which include the opening formalities from the first evening, each day's morning chanting, and all other chantings from throughout the course. The Pali or Hindi text appears with the English translation on the screen in sync with the audio of Goenka's chanting. The only difference between the Economy version and the Slimline version is the packaging of the DVD. The disc itself is identical.